I just tuned into the State of the Union. How's Obama doing? Does he have anything new to say? Lots of red states, blue states, United States stuff. Criminal Justice: The crime rate and numbers of prisoners has declined at the same time. We need to keep reforming our criminal justice system. He uses the example of a father whose son is harassed by police, and a woman waiting for her police officer to come home after his shift. It seemed like there was louder applause for the police officer's wife. 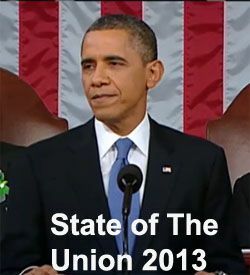 President Obama delivers his State of the Union Address. Here's a place for your thoughts. President Obama's State of the Union speech is tonight. He's expected to lay out a strategy for getting around Congress to implement some of his goals. Obama will make clear in his 9 p.m. (0200 GMT Wednesday) address that he is willing to bypass U.S. lawmakers and go it alone in some areas by announcing a series of executive actions that do not require congressional approval. ..."What you'll hear in the speech tonight is very concrete, realistic proposals as it relates to wages, as it relates to education, as it relates to training, high-tech manufacturing, retirement security, those are the things that he's focused on," White House Chief of Staff Denis McDonough said on NBC's "Today Show." President Obama is about to deliver his State of the Union Address. Here's a thread to discuss it. No ABC for me. They started out showing all the people there supporting more gun control. And then said they will show updates of Dorner on the bottom of the screen. "We can either settle for a country where a shrinking number of people do really well, while a growing number of Americans barely get by,” he will continue. “Or we can restore an economy where everyone gets a fair shot, everyone does their fair share, and everyone plays by the same set of rules. He'll remind us once again that in his view, this is not a Republican or a Democratic issue, but a U.S. issue. I hated that line in his 2008 campaign (no red states or blue states) and I doubt I'll like it much more tonight. Big Tent Democrat will be here to share his thoughts on the President Obama's State of the Union address which begins at 9pm ET. Until then, here's the speech as prepared for delivery and sent out by the White House. What comes of this moment will be determined not by whether we can sit together tonight, but whether we can work together tomorrow. With their votes, they’ve determined that governing will now be a shared responsibility between parties. New laws will only pass with support from Democrats and Republicans. We will move forward together, or not at all – for the challenges we face are bigger than party, and bigger than politics. Obama has a new target: Medical malpractice reform "to rein in frivolous lawsuits." Of course, that's nothing new. He voted for it while in the Senate and pushed it in 2009. With 45 minutes to go, here's a place for your pre-speech concerns. "Those who obey the law should be protected by the law." Everyone should be protected. Obama gets an "A" because of the leadership he displayed, his passion in delivering the speech and the confidence he inspired in us. We think our Government is in good hands. How would you score the speech and the President? President Obama's State of the Union address begins at 9pm ET. If you are not by a TV, you can watch live on C-Span here or at the White House website. The topics: "Restoring security for middle class families after a lost decade of declining wages, eroding retirement security and escalating health care and tuition costs," unemployment, health care, and the wars in Iraq & Afghanistan. I assume that all of you know tonight is a red letter night in American history. It is the last time George Bush will give a State of the Union.If we all do our part, next year it’ll be a Democratic President giving the State of the Union. Let’s be clear, one thing that President Bush has never understood is that the State of the Union is not about a speech in Washington. It is about the state of the lives of the American people. What is happening in our schools, in our hospitals, in our jobs? It is whether or not we have people who feel that they are moving toward the American dream or whether it looks like it’s getting further and further away no matter how hard they work. It is about whether or not people will be able to stay in their homes or if they will lose their homes to foreclosures, thereby really undermining the American dream. It is about whether we as a nation will restore our leadership and our moral authority, bring our Constitution out of cold storage, begin to act like Americans again, solving our problems, working toward a better future, making it possible for us to be proud of our country.